Live in style at Camden Visconti in one of our spacious one, two and three bedroom apartment homes. You will have easy access to everything in Tampa and all that Brandon has to offer. With easy access to I-75, Hwy 301, I-4 and the Selmon Expressway our location makes it easy for any commuter. Located only five minutes from Publix, Wal-Mart, Costco and Super Target makes picking up your everyday conveniences a breeze. Need some entertainment, shopping and food options? 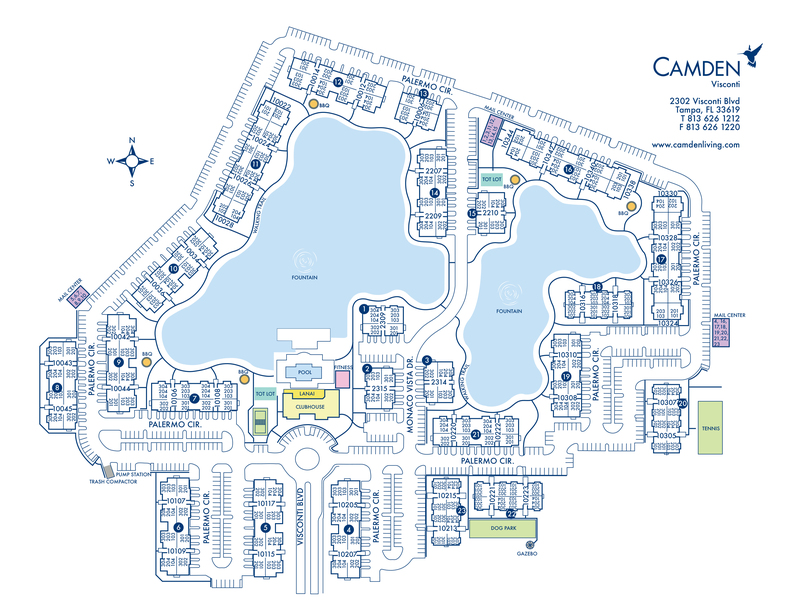 Top Golf, Westfield Brandon Shopping Center, IKEA, World of Beer, iFLY Tampa, Carrabba's Italian Grill, and Fords Garage are just around the corner from Camden Visconti. When you move into an apartment home at Camden Visconti, you will love the modern comforts of a full-size washer and dryer, spacious walk-in closets, and USB outlets to charge your devices. Cook your favorite meal in our kitchens with dark cherry cabinetry, built in microwaves and plenty of room to store your groceries in the kitchen pantry. Enjoy the warm weather and a nice glass of wine on your private screened in patio or balcony. Want a guaranteed private parking spot? You are in luck! We have quite a few apartments that feature an attached garage with a private driveway. Perfect your sidestroke in our relaxing pool or lay out on our sundeck or in our poolside hammocks. Your kids will love our two playgrounds and the activity center that is inside the fitness center. It’s easy to keep an eye on your children while you walk on the treadmill or lift some weights. Even though we are close to the beaches, you can play sand volleyball anytime at our court which is only a few steps from your apartment. Volleyball, not your sport? Hit a few balls with your friends on our tennis court or get away from the heat and hang out in our clubroom where you can cheer on your favorite team in front of a large screen TV, play poker and play a round of billiards. The onsite business center is the perfect quiet place to get work done with complimentary WiFi and a printer. The amenities are endless at Camden Visconti! Our pet-friendly community is perfect for every four-legged friend! Enjoy the day playing ball with your pooch in our fenced in dog park which has two entries, one for smaller pups and one for larger dogs. The dog park even has a gazebo to help you stay cool while playing. Your pet will love stopping by the leasing office to pick up a yummy treat. Camden Visconti is only minutes from Banfield Pet Hospital, Fuzzie Buddies, Davis Island Dog Beach and Mango Dog Park. It is your pet’s dream! Come home to Camden Visconti for convenient living. Call today to make an appointment to see your beautiful new apartment home! Get the perfect spot! We have open parking for our residents and visitors on a first-come, first-served basis. Select apartment homes include attached garages with private driveways.